The unexpected is the spice of life! 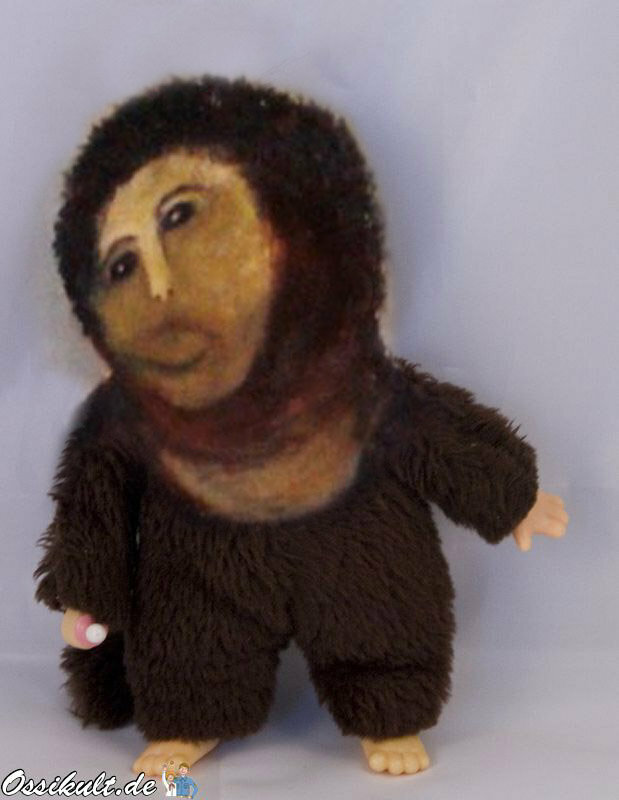 In the Spanish town of Borja's church of Our Lady of Mercy, there is a 19th century painting of Christ by Elías García Martínez that had been damaged by time and humidity. 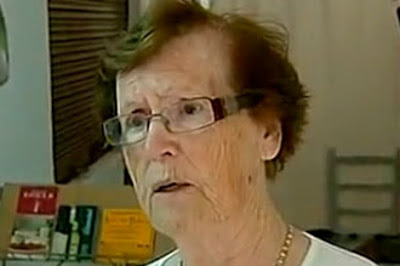 One of the parishioners, Cecilia Giménez, offered to restore it as a favor to the church. An octogenarian with sincere faith, good intentions, and a love for painting, she set to work with the pastor's permission. Obviously, it would be a severe stretch to apply the word "restoration" to Cecilia's work. 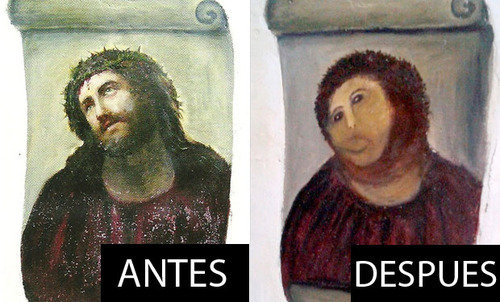 The new version has become famous as "the worst restoration in history," with thousands of "pilgrims" and foreign media descending on Borja to see and photograph the painting. Since Borja is a tiny town of only 5,000 people, the sudden influx is unprecedented. The local townspeople have rallied around Cecilia, defending her good intentions and her sincere love for the painting (and the free publicity for their town). They have pointed out that her life has been hard and filled with suffering, since she has had to care for her disabled son (he is now 60) during her entire adult life. Cecilia has since suffered an "anxiety attack" upon seeing the ridicule poured on her restorative attempt. Some have said the town should file a lawsuit against her for destroying the painting. But her defenders say that the original possessed little artistic merit and that Cecilia's mental health is more important than a painting. Although the town has already begun contacting restoration professionals to undo her work, some townspeople say they want the new version to stay. I think my favorite here is Chewbacca. 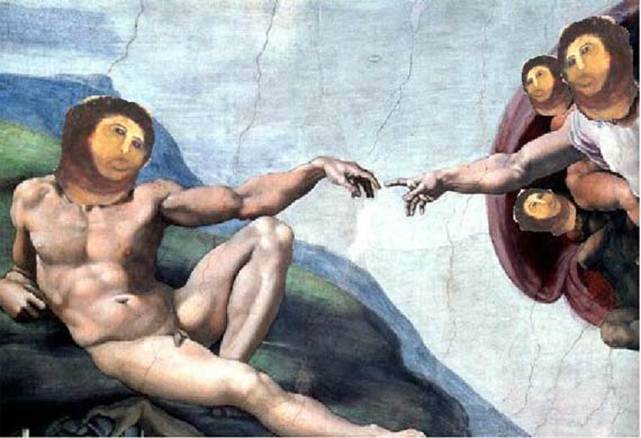 A suggested restoration of Michelangelo's The Creation. 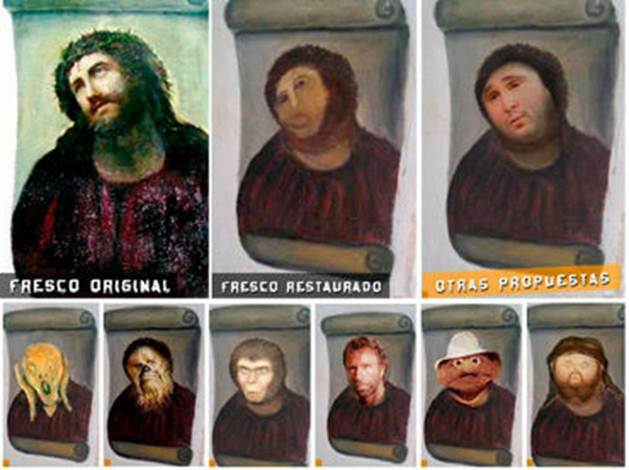 It must be said: the restoration is tragicomic. 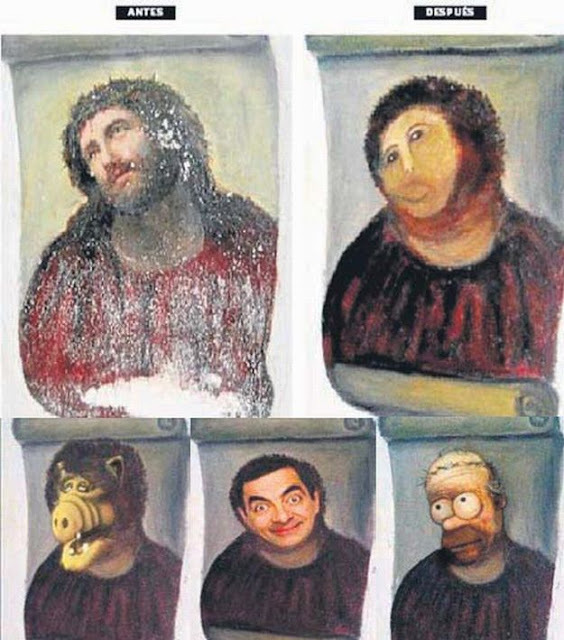 Some would see all the joking as a sad sacrilege, a modern-day mockery of Christ. Others see it simply as a rather humorous artistic failure that lends itself perfectly to parody. There are those who sincerely like the painting. There are others (many more) who think it is a disgrace. And there are those who have laughed so hard at the whole debacle that it has made their day. Another painter of dubious talent once said that we all have our fifteen minutes of fame. This is Borja's time. And poor Cecilia's. Let's hope she gets through it alive. In the end, one person's life and soul is more important than a painting... we are the masterpieces that God created good, and sometimes our own attempts to "improve" God's work may end up just as badly. And our sincere gifts to Him probably look just as ridiculous, like a child's first unskilled art projects. I imagine God hides a smile and accepts our gifts gratefully... and adds his own restorative genius behind the scenes, making them a bit less simian, a bit more human, a bit more divine. Hi there! This is where I sporadically share thoughts that occur to me in the wee hours of the morning.